BOOK DESCRIPTION: Kristina's stay at summer horse camp is horrible to say the least, and it's all because Hester and Davina are there as well, making her life miserable. When Hester's cruel prank goes terribly wrong, it's actually what sends the three girls back to the magical land of Bernovem. In Bernovem, Kristina is very excited to see her former friend, Prince Werrien. When he invites her to sail with him on his ship to his homeland Tezerel, putting it simply, Kristina can't refuse. the "Black Shard", Kristina is haunted by a ghostlike old hag. Struggling against suspicion, guilt, illness and ultimately the one who wants to possess her soul, Kristina will see it's in her weakest moment that she will encounter more strength than she has ever know. I read and reviewed Victoria Simcox' The Magic Warble about two years ago and found it to be a fun fantasy read, perfect for the whole family. Warble's sequel, The Black Shard, gamely picks up where Warble left off, a year or two in the future with our nimble heroine, Kristina, returning to the mystical land of Bernovem. I loved returning to Bernovem, seeing the fairies and gnomes and talking animals (my favorite!) through Kristina's eyes and those of Hester and Davina. Ms. Simcox' descriptive writing is so perfect when we are being treated to Bernovem, such a colorful place that comes through clearly in the book. What makes The Black Shard a bit different from its predecessor is that it's not just Kristina who travels to Bernovem but her not so friendly acquaintances due to Hester's prank. It gave the story a fresh spin. As I liked Kristina in The Magic Warble, I liked her here as well. Despite the fantasy element, Kristina is very much a real teenager and faces normal issues, like self-esteem and the intense feelings surrounding a teenaged crush. Her budding relationship with Werrien is much more important and front and center in this book versus the first one. Parents have no worries - - this romance is very tween oriented and suitable for all. I also liked Werrien - - I think it was nice to read of a prince who is self-assured in general and yet is still anxious about his feelings for Kristina. He's a typical teenage boy who just happens to be a prince of a magical fantasy land. The Shard of the title is an interesting mystery, a stone that gives off unusual images. What role it plays and how Kristina is going to address it is not as clear as her role in The Magic Warble. What are the visions Kristina is seeing? Is she the only one who can see them? And why? The story will keep you guessing right up until the last pages with a nice twist. As I stated in my review of The Magic Warble, there are definite undertones of The Chronicles of Narnia series. It's an easy read, family-friendly, a quick moving story with a wonderful fantasy element. The door is also left open for further visits with Bernovem and I hope that Ms. Simcox will share another installment with us. 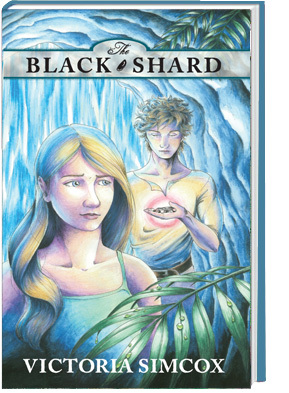 The Black Shard is a perfect book for tweens, teens and adults who enjoy fantasy. Get in touch with your inner child and lose yourself in Bernovem. The Black Shard is available for purchase now at major booksellers, including Amazon. I am an Amazon affiliate. If you make a purchase through my link I will receive a small commission. Review copy of this book provided by the author in exchange for a fair and honest review. In no way did the provision of this book affect the outcome of my review. For more information on author Victoria Simcox, please visit her website. To read my review of The Magic Warble, please go here. Hints of The Chronicles of Narnia. Will have to read The Magic Warble too.